Liam Devaliant, fifth Earl of Lockwood, is a man with a mission: to see justice served and exact punishment on the man responsible for Lockwood’s abduction, imprisonment and torture. With the help of his friends Julian, Duke of Auburn (The Duke of Shadows), and Crispin Burke, MP (A Lady’s Code of Misconduct), he will achieve his goal, but his plan requires careful attention. He believes that he will have time later to consider his wife whom he has not seen since their wedding night almost four years earlier. He is confident that she won’t know he is back in England for at least a month. When her husband disappeared on their wedding night, Anna Winterslow Wallace Devaliant, Countess of Forth and Countess of Lockwood, concluded that he had left her. Because being left has been a pattern in her life, Anna accepts that Liam is just another person she loved who abandoned her. She retreats to her home on the Isle of Rawsey, but when she learns indirectly that her husband has returned, she goes to London, filled with anger over his abandonment, her weakness in loving him, and his failure to inform her of his return. To make matters worse, he has been in London for eight months, although she learned that fact only when she read it in a newspaper. What she finds in London adds more fuel to her anger. For a variety of reasons, Liam is not pleased that Anna is in London and planning to stay in their house. He knows that the young man Anna married is dead, and he has no plans to tell her what happened to him. He cannot bear the thought of her pity nor the memories her presence evokes. There is also the problem of Lockwood’s fellow survivors, men who have no family, no resources, and no place to go except the home he has given them. Anna, ignorant of the true circumstances, sees them only as incompetent staff who need to be replaced. The first words Anna and Lockwood exchange after their long separation are revealing. Anna refuses to leave until she achieves her goal. As Countess of Forth, she holds a Scottish title that descends through her, and she wants an heir. Anna feeds her anger with reminders of Lockwood’s desertion, and he plays the role of the dissolute aristocrat, hiding his broken self from Anna. When he does tell bits of his story, he does so in a manner that convinces Anna he is lying. Although they share rare moments of passion and of connection beyond the physical, for the most part, they hold to their entrenched positions. But when Anna sees the brutal reality of Lockwood’s experience, she becomes his defender and champion, as determined as he to see the man behind his torment punished. But are the demons that haunt Lockwood too powerful to allow him to give and receive love? The Sins of Lord Lockwood is the sixth book in Duran’s Rules for the Reckless series. It is the darkest and the strongest novel in an extraordinary series. Duran uses flashback chapters to show Anna and Lockwood’s meeting and marriage. The contrast between these younger, more innocent characters and the wounded survivors they have become is stark, making the wrongs done to them more heinous. Anna is independent, assertive, and frank. She demonstrates impressive strength while remaining a woman of her time and circumstances. Her love for Rawsey and its people is real, but, as she comes to realize, Rawsey has also served as refuge where she could hide from her pain. Anna and Liam are both damaged people, but his physical and psychic wounds are deeper and more pervasive than hers. Liam has survived hell and has been irrevocably changed by it. The loyalty he inspires in Julian and in his fellow prison camp survivors is a testament to his courage and honor, but he is a man who faces life without joy or hope. Anna’s presence forces him to realize that once his need for revenge is satisfied, his life will be without purpose. The battle he and Anna fight together to move him from mere physical survival to a rebirth as a full, functioning self is fiercer than his struggle with his enemy. There are so many exceptional things about this novel that no one review could list them all. I loved the gender reversal with Anna as the one demanding an heir. I loved the way Duran handles the love scenes. They could serve as textbook studies on how to write a highly sensual scene that also reveals character, exposes vulnerabilities, and moves the story to the next level. And each one is distinct and exactly right for that moment in the story. I love than even in a book that is almost unbearably dark, there are flashes of light and laughter. And, as always, Duran’s prose is lucid and powerful. Perhaps to a greater degree than any author I know, her prose beautifully demonstrates the effect of simplicity and conciseness. Note the preponderance of single-syllable words in Anna’s response to Liam’s shame over his scarred body and emotional punch of “triumphant” in contrast. And then she claims him: “You are mine and I am keeping you.” Not a wasted syllable. That’s good writing! It is difficult for me to separate this book from The Duke of Shadows where Anna and Liam’s story begins and to which parts of this book run parallel. I think The Sins of Lord Lockwood can be read as a standalone, but I think the reading will be a richer experience for those who have read The Duke of Shadows, Duran’s debut novel. If romance with angst is your preference, you do not want to miss this book. I confess that I had to take a break a few times when reading it became too difficult for me. 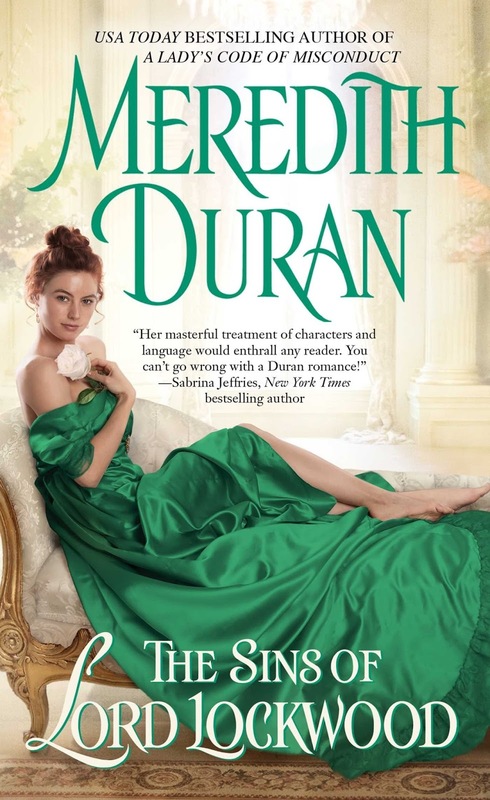 I often choose the light-hearted over the darker romances, but I never miss a Meredith Duran book. This one required me to re-order my favorites by her, and it is a sure bet for my Best of 2018 list. If you like historical romance with complex characters, a compelling plot, and a total impact that leaves you questioning the claim that there are no perfect books, I highly recommend The Sins of Lord Lockwood. Sounds exactly like my type of read and I've enjoyed her stories! Mine too, Amy. :) She went on my auto-buy list with her first book, Duke of Shadows. I love your reviews as they always make me want to read the book in it's entirety. What a lovely compliment! Thanks, Diane. This sounds really good. It's been so long since I read Duke of Shadows that I may have to re-read it before starting this one. I did a quick reread of DOS, Kim. I wanted details fresh in my mind when I read the new book--not that rereading DOS is a hardship in any circumstances. Both books are extraordinary. What a wonderful review. I have to get these two books and follow Ian & Anna's journey. A definite read for me. I hope you enjoy both books, Carol. Thanks, Janga! I think I need to reread Duke of Shadows too before starting this one. It's been a few years. I love Meredith Duran's books. She's such an amazing talent. She is indeed, PJ. I think she is under-appreciated. IMO, her books should be topping bestseller lists.